View More In Tongue Cleaners. The American Dental Association (ADA) recommends using a tongue cleaner to get rid of the buildup of plaque and bacteria on your tongue. After brushing your teeth plaque and bacteria are left behind on your tongue, the tongue cleaner will get rid of the excess bacteria and plaque giving you a cleaner and better smelling mouth. WowE is today's brand of choice for environmentally and hygiene conscious men, women and children. 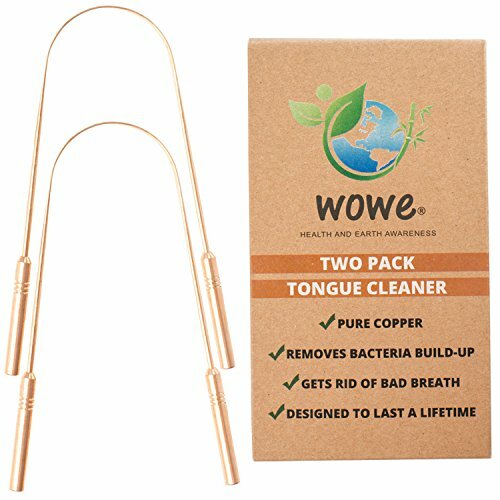 Its pure copper tongue cleaner is highly flexible and completely smooth creating the perfect design to reach the surface of your entire tongue and will not cause gagging reflexes or scratches. It is estimated that the average American throws away 185 pounds of plastic per year and takes up to 1000 years to decompose. All of this plastic makes its way to landfills and oceans causing toxins to seep into the ground and threatens sea life. This is why our tongue cleaner is completely plastic free and packaged in plastic free packaging. Up to 95% of copper is made from recycled material, is toxin free and 100% recyclable. If copper is not recycled and makes its way into the landfills it will not leak any toxins into the soil or groundwater. Copper has a incredible long life span, the WowE Copper tongue cleaners will last you a lifetime. We partnered with One Tree Planted to donate 1% of sales to bring trees to areas that have experienced deforestation. MADE OF PURE COPPER - will not rust or collect mold. GETS RID OF BAD BREATH by removing plaque and bacteria build up on your tongue. WORKS BETTER THAN A TOOTHBRUSH - the curved design and smooth surface creates the perfect shape to reach your entire tongue. Toothbrushes are not designed to clean your tongue. ADJUSTABLE to fit any size mouth. Small or big you can bend the tongue cleaner to perfectly fit your mouth. OUR PACKAGING IS PLASTIC FREE - We use kraft packaging which is made from recycled material and is completely plastic free. Each box comes with two tongue cleaners. If you have any questions about this product by Wowe, contact us by completing and submitting the form below. If you are looking for a specif part number, please include it with your message.